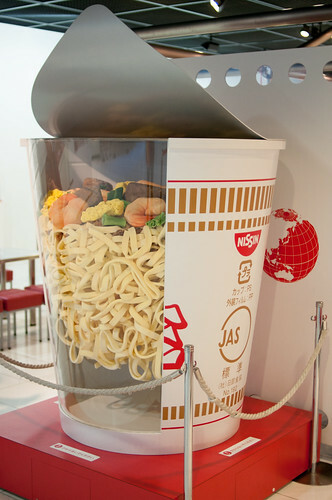 Instant noodles were first developed in Japan and rapidly became a very common and very popular food item throughout Asia and then throughout the rest the world. There are now a variety of Japanese instant noodles available and on this page we are going to take a closer look at the history of Japanese instant noodles along with the different types of noodles and the different brands available. Ramen noodles first came to Japan from China although no one knows the exact date. The process for taking traditional Japanese Ramen noodles and turning them into instant noodles was accomplished by Momofuku Ando shortly after World War II. At this time there were food shortages and Ando wanted to come up with a way that noodles could be stored for a long period of time and prepared quickly. After a great deal of trial and error he eventually discovered that by deep frying boiled noodles in very hot oil he was able to remove the water from them. The noodles also have a number of small holes on the surface that allow hot water to penetrate them quickly which allows the noodles to return to their original condition and make them ready to eat. Instant noodles do have a shelf life usually in the range of 3 to 12 months depending on the style and packaging. There are a variety of Japanese instant noodles available now. Ramen noodles are still the most common and this type of noodle is a wheat noodle that is served in a meat or fish based broth. Udon noodles are normally served as a hot noodle soup with a mildly flavored broth. If you want to increase the richness of your instant noodles, please read our article "How to make your Instant Ramen Soup Base/Stock taste Authentic." Soba noodles are a thin type of noodle made from buckwheat flour and are normally served either in a hot broth or chilled with a dipping sauce. Another common type of Japanese instant noodle is Sosu Yakisoba which translates to "fried noodles and sauce" and it is a derivative of Chinese chow mein. The very first brand of instant noodles created by Momofuku Ando was Nissin and Nissin Food Products is still the most popular brand today. The next most popular brand is Tōyō Suisan which has the nickname of Maruchan. Other brands include Sanyo Foods, Myojo Foods, and Acecook. With the invention of instant noodles Momofuku Ando certaily accomplished what he set out to do and that was to create a food item with a long shelf life that could also be prepared quickly and easily. Because instant noodles last a long time, are easy to prepare and because they are inexpensive and taste great, Japanese instant noodles have enjoyed immense popularity for decades which continue to this day. You can read more on other types of Japanese Noodles here. If you’ve ever been in a first class Japanese restaurant, then you were probably handed some hot towels in a basket or plate. You may have seen miso flavored soups in your local grocery store. But what is Miso? Miso is a seasoning that is made from fermenting rice, barley or soy beans.